August 28, 2015: The Ending Childhood Obesity Commission recently held its PAHO regional consultation in Mexico on August 26 and 27. The meeting was organized by the World Health Organization PAHO regional office and was attended by countries from the region. This consultation is the third in a series of regional consultations, the Commission is holding globally to seek regional perspectives on the issue. The meeting was chaired by our President, Dr. Sania Nishtar, who co-chairs the Commission on Ending Childhood Obesity. August 14, 2015: Heartfile is pleased to launch its new titled “Pakistan’s Population Emergency”. The documentary focuses on Pakistan’s five-decade long commitment to Universal Health Coverage for Family Planning and its failure to impact desired outcomes. In particular, it aims to create awareness about the post-18th Amendment health systems constraints plaguing the population sector and resulting costs of inattention. In addition, it also outlines specific solutions and the potential opportunity, which exists to overcome these constraints. The documentary can be downloaded from a dedicated webpage. We have placed the documentary in the public domain and encourage dissemination. In order to facilitate that we have also posted guiding questions to facilitate screening and discussion sessions, for use by facilitators. 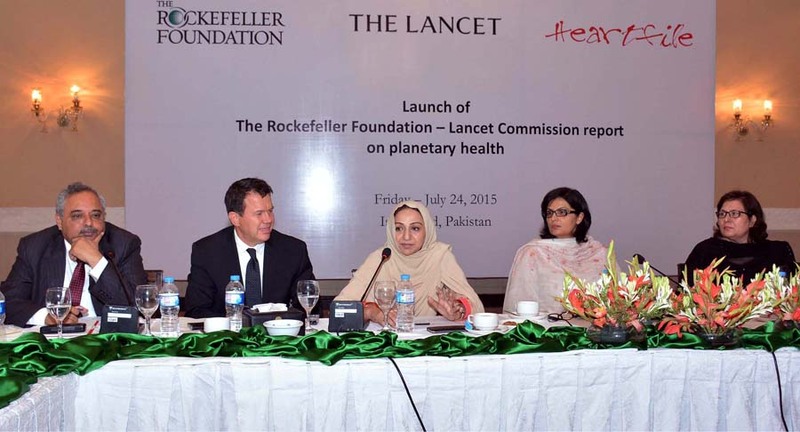 July 31, 2015: The Rockefeller Foundation-Lancet Commission on Planetary Health released its seminal report on June 16 in New York. The report, Safeguarding Human Health in the Anthropocene Epoch, provides the “first ever comprehensive examination of evidence showing how the health and well-being of future generations is being jeopardised by the unprecedented degradation of the planet’s natural resources and ecological systems”. It calls for “immediate global action to protect the health of human civilization and the natural systems on which it depends”. Subsequent to the global launch, other launches were held in Los Angeles and South Africa while still others are planned in Chile, China, Kenya, Australia, Abu Dhabi and Malaysia, each hosted by a respective commissioner. The Pakistan launch was held in Islamabad on July 24 and was hosted by Dr. Sania Nishtar, one of the 15 commissioners on the Planetary Health Commission. Details about the launch can be accessed here.